Newscastle man Morgan McCartan was the lucky winner of a gourmet Flahavan’s Porridge hamper following his entry into the Flahavan’s and Age NI, ‘Like your grandparents used to make it!’ competition. Morgan, who was randomly selected as one of two regional winners shared his favourite breakfast memory of the first time he gave his daughter a spoonful of Flahavan’s porridge which has now became a firm favourite on their breakfast table! 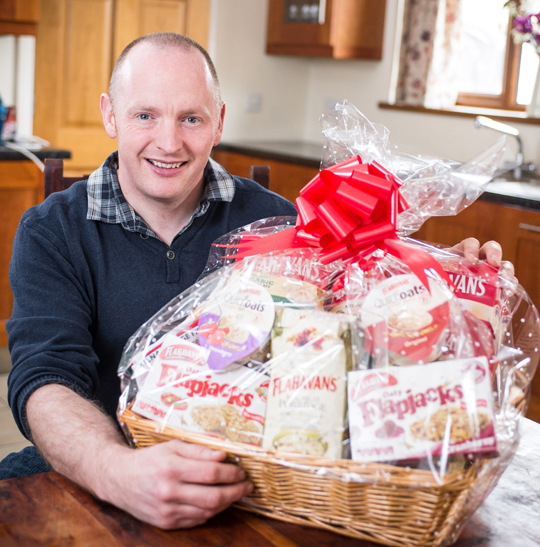 The ‘Like your grandparents used to make it!’ competition encouraged grandparents, mums and dads to take a trip down memory lane and share their favourite porridge recipes, memories and photos for the chance to win a delicious Flahavan’s hamper. Morgan McCartan from Newcastle knows his oats.